Our comfortable Queen guest room at Hotel Iris features a pillow-top mattress, luxury linens, and black-out drapes/curtains. Each of our 79 rooms include a microwave, refrigerator, and coffee/tea maker. Guests can enjoy a spacious bathroom that is equipped with a full bath, complimentary toiletries, and plush towels. This beautiful San Diego hotel room provides a 50” HDTV with cable channels, work desk with a lamp, iron and ironing board, in-room climate control, free WiFi, and daily housekeeping. This Queen Bed Room provides comfort for all guests of Hotel Iris. 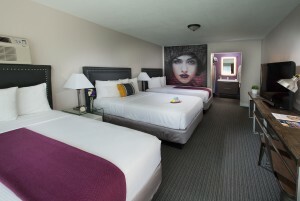 Our Double Queen guest room at Hotel Iris is a perfect guest room for those traveling as a party of four. This spacious room provides comfort as guests can unwind in our luxury linens, watch TV on our 50” HDTV, and enjoy Free WiFi. Each bathroom features a full bath, vanity, complimentary toiletries, hair dryer, and plush towels. Additional in-room amenities include an iron and ironing board, in-room climate control, work desk with lamp, microwave, refrigerator, and coffee/tea maker. Make yourself at home in this spacious Double Queen bed room. Our Triple Queen Bed room is an ideal room type for those traveling as a large group or family. This room has plenty of space for everyone and can accommodate 6 guests. Hotel Iris guest rooms all feature a 50” HDTV, work desk with lamp, luxury linens, black-out drapes/curtains, iron and ironing board, and a private bathroom. Guests can enjoy a private bathroom that is equipped with a full bath, complimentary toiletries, hair dryer, plush towels, and a vanity. To ensure that guests can fully enjoy San Diego, this Triple Queen Bed room includes a microwave, refrigerator, and coffee/tea maker. 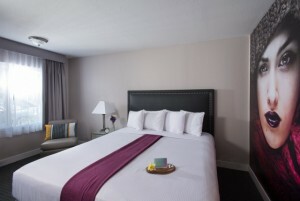 The King bed room at Hotel Iris can accommodate 2 guests and provides all essential amenities to make your stay in San Diego stress-free. Guests can unwind after a long day and enjoy our 50” HDTV with cable channels, free WiFi, pillow top mattress, luxury linens, and blackout drapes/curtains. This luxury rooms features a private bathroom with a vanity, full bath, plush towels, hair dryer, and complimentary toiletries. Staying in the King Bed Room at Hotel Iris guarantees a comfortable and relaxing stay. For ultimate comfort, guests of Hotel Iris can enjoy this King Suite that features a luxurious Jacuzzi. With this room type guests will find a 50” HDTV, luxury linens, black-out drapes/curtains, iron and ironing board, microwave, refrigerator, and coffee/tea maker. Complimentary toiletries, a hair dryer, plush towels, and a vanity are also included in the private bathroom. This San Diego guest room provides ultimate comfort in this spacious King Jacuzzi Suite. This Kitchen Suite is a perfect room for those who are looking for a relaxing bedroom. This spacious guest room can accommodate 2 guests. For our guests comfort, one 50” HDTV are equipped in this room along with a microwave, refrigerator, coffee/tea maker, iron and ironing board, in-room climate control, and a private bathroom. The private bathroom features a shower, vanity, complimentary toiletries, hair dryer, and plush towels. Take advantage of our Kitchen Suite at Hotel Iris that provides spacious accommodations. Our 1 Queen Bed Accessible room comes with 1 queen bed that can easily accommodate two people in comfort. The Hotel Iris offers handicap accessible rooms for guests with special needs. In accordance with the Americans with Disabilities Act, our hotel includes suites that have been designed for guests that utilize a wheelchair or require extra space. Our hotel has policies in place to ensure that handicap accessible rooms are reserved for guests with special needs. In addition, our public spaces are all wheelchair accessible. Our parking facility features handicap parking with wheelchair ramps to access the main lobby. Our accessible room should be reserved by those in need of an accessible room type. 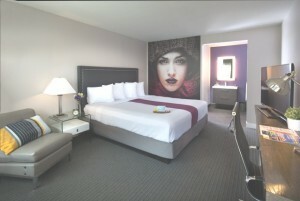 Our Double Accessible Queen guest room at Hotel Iris is a perfect guest room for those traveling as a party of four. This spacious room provides comfort as guests can unwind in our luxury linens, watch TV on our 50” HDTV, and enjoy Free WiFi. Each bathroom features a full bath, vanity, complimentary toiletries, hair dryer, and plush towels. Additional in-room amenities include an iron and ironing board, in-room climate control, work desk with lamp, microwave, refrigerator, and coffee/tea maker. Make yourself at home in this spacious Double Queen bed room. Our accessible room should be reserved by those in need of an accessible room type.